Tuesday, March 5 is a day postmaster Kevin Beechey is unlikely ever to forget. What began as a normal morning for the Network Rail worker started to turn into anything but when he spotted a package addressed to ‘London Waterloo station’. Kevin took the parcel over to his desk and laid it down to take a closer look. “I had a light feel over the edges and could feel there was a package inside a package. I very carefully cut along the edge with my scissors and had a little peak inside and saw a jiffy bag that had masking tape all the way around the edges and a little piece of string sticking out of the bottom. That was enough for me. A colleague went into the station to grab a BTP officer. Soon after they arrived and inspected the item Network Rail’s Waterloo office was evacuated. “My legs were like jelly,” added Kevin. “Because we couldn’t really say what it was or anything, we were telling people to get up and go. Once outside the full gravity of the situation hit Kevin when he heard police sirens and saw sniffer dogs being deployed. It was at this point that Kevin was taken away by police officers to have his fingerprints, handprints, swab and DNA taken, as well as a five-page statement recorded as part of their investigations. 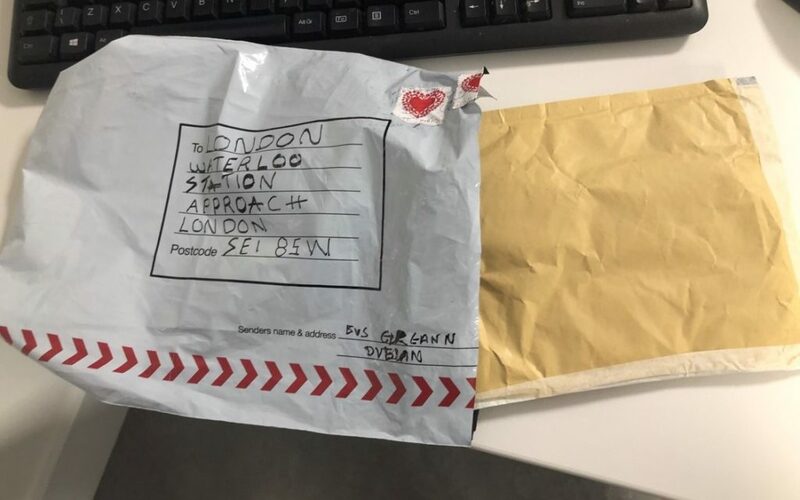 Unbeknown to Kevin at the time, two other suspicious packages had been sent to transport hubs in the capital: one to London City Airport’s headquarters at Aviation House and another to Heathrow Airport’s administrative centre at Compass Centre. All three contained explosives which, according to the Metropolitan Police, appeared capable of “igniting an initially small fire when opened” as demonstrated by the device at Heathrow which caught fire when it was opened. Counter-terror police are investigating all three packages. Since the event, Kevin has been inundated with chocolates, cakes and thank you cards and, to top it all off, he even received a surprise award from chairman Sir Peter Hendy (pictured right alongside Kevin) and chief executive Andrew Haines.